Wire: 24AWG, stranded, category 5. Meets or exceeds EIA/TIA 568a specifications. Molded or assembly strain relief available. Available in 3', 6', 10', 15', 25', 50', 75', and 100' length. Available color: black, blue, beige, white, yellow, gray, red, orange, green. Premise data cable applies for all types of data transmission applications, primarily for RF or EMI, the RJ-45 modular plug with full metal shell. The predominated media choice for computer and LAN communications, the RJ-45 modular plug without metal shell. 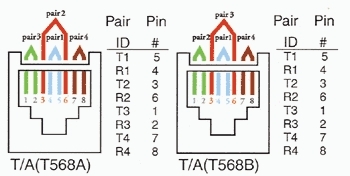 T568A and T568B wiring scheme are nearly identical except that pairs two and three are reversed. T568A is the preferred scheme because it is compatible with 1 or 2 -pair USOC system. Either configuration can be used for Integrated services Digital Network (ISDN) application.